Don’t forget we offer a subscription for just $6 a year. 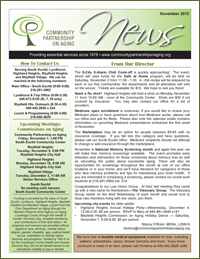 If you prefer to get the newsletter mailed directly to your home, please send a check made out to Community Partnership on Aging to 1370 Victory Drive, South Euclid, OH 44121. Include a note with your name and address and indicate you would like to begin receiving the newsletter.